World’s largest “eye on the sky” E-ELT is now all set to start its construction after getting approval from the Council of ESO’s in the recent meeting. E-ELT (European Extremely Large Telescope ) will be a 39-metre aperture optical and infrared telescope sited on Cerro Armazones in the Chilean Atacama Desert, 20 kilometres from ESO’s Very Large Telescope on Cerro Paranal. 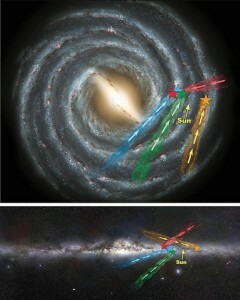 Now obliviously few questions immediately strikes in mind but ESO has generously and answered them……such as. What are researchers hoping to find and achieve with the E-ELT? What are the main differences between the E-ELT and existing telescopes? 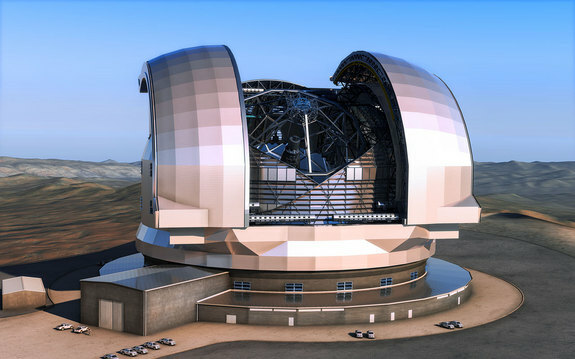 A: The European Extremely Large Telescope (E-ELT) will have a 39-metre mirror (almost half the length of a soccer pitch) and will thus be the biggest telescope in the world — by far — to observe in the visible and the near-infrared (there are of course larger radio telescopes). In other words, it will be the world’s biggest “eye” on the sky. The current largest optical telescopes have a diameter of about 10 metres, and the E-ELT will thus be four times greater.This diameter was chosen because it is the minimum diameter needed to achieve some of the driving science cases: to image rocky exoplanets to characterise their atmospheres, and to measure the acceleration of the expansion of the Universe directly.The main principle behind the telescope is that it is an adaptive telescope. Adaptive mirrors are incorporated into the optics of the telescope to compensate for the fuzziness in the stellar images introduced by atmospheric turbulence. One of these mirrors is supported by more than 6000 actuators that can distort its shape a thousand times per second. atter and dark energy. On top of this astronomers are also planning for the unexpected — new and unforeseeable questions will surely arise from the new discoveries made with the E-ELT. The E-ELT may, eventually, revolutionise our perception of the Universe, much as Galileo’s telescope did, 400 years ago. Traditional description of time is based on the thermodynamic time asymmetry which assumes that any given system begins in a low entropy state and then, driven by thermodynamics, its entropy increases. Or in more simply that past is low entropy and the future is high entropy. If Complexity is considered as dimensionless quantity then, in its most basic form, it describes how complex a system can be. And, when one observes the Universe, it can be easily deduced that complexity is directly linked with time; as time progresses further in forward direction, the Universe becomes increasingly structured and complicated. Flavio Mercati of the Perimeter Institute (PI) for Theoretical Physics in Ontario, Canada, states that “The question we seek to answer in our paper is: what set these systems in that very low-entropy state in first place? Our answer is: gravity, and its tendency to create order and structure (complexity) from chaos,” explaining their recent study published in the journal Physical Review Letters. Over Universal scales, our perception of time is driven by the continuous growth of complexity, but in these subsystems, entropy dominates. We know what the universe looks like today and we have a pretty good idea about how it started- with a big bang. But what happened after big bang until now?? To understand this scientist at MIT have developed a simulation so complex that took three months of computer number-crunching, combining 8,000 CPUs all running in parallel. If it was to run it on a single desktop it will take 2000 years. The model of the universe spans a cube of 350 million light years across and over 13 billion years of simulated time at an unprecedented resolution. A large enough chunk to be representative of the whole universe, but detailed enough to each individual galaxies – a feet what no any other team has managed. The model doesn’t tackled just that the universe has huge range of scales, but it also richly describe the forces of work much better than previous attempts. By fracting the laws of physics and variety of theories about how gases cool and how star evolve and black holes grow, the model recreates stars and galaxies which we can see and the dark matter and dark energy we can’t. 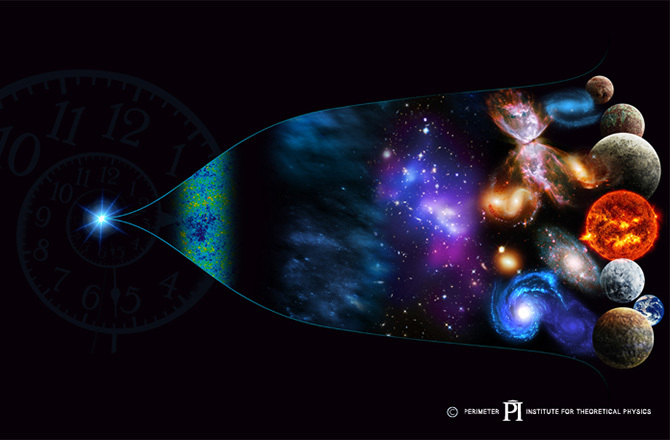 The simulation starts just 12 million years after the big bang when things start to get interesting. Dark matter clusters together under the forces of gravity, if we could see it it would look like web. Scientists call it a cosmic web. 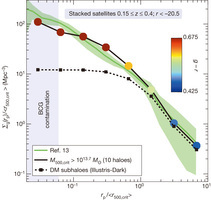 Wherever the dark matter is densest ordinary matter also comes to form into galaxies. Simulation also shows the distribution of all the elements. The early universe was full of Helium and Hydrogen. As star evolve and die in supernovae they fuses the basic elements to form the heavier ones carbon and oxygen and as well as metals. The violent burst across black hole spread these elements across the universe. Life depends on these building blocks, only when you have enough of them then the planets and complex molecules form. 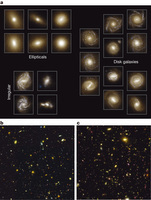 The big challenge the team say was recreating the variety of galaxies that we observe. Simulation produces the world that is remarkably similar to our real universe that we see today through our telescopes. And because the simulation matches our observations so well it give as a greater confidence in understanding our universe today. How it began? How galaxies are formed? What is it made up of? What laws govern it? But as with other models where the simulation fails to represent, it challenges and and puts forth a question that – WHAT MIGHT BE YET STILL MISSING? 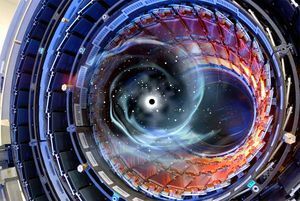 Many scientists wondered if the Large Hadron Collider (LHC), a circular, underground tunnel at CERN near Geneva, Switzerland, might become a “black hole factory,” possibly generating a black hole as often as every second at high speeds around the 17-mile (27-kilometer) circular particle accelerator before atomic nuclei colliding into targets at near the speed of light. Some even raised fears and postulated the danger from a stray black hole or a quantum black hole resulting from collisions. But this was merely fears and LHC ran well and good giving fruitful results including the Higgs boson. A quantum black hole is not yet been discovered in any of the experiments conducted because they would have been decayed into pairs of particles and jets of radiation that ATLAS could detect. There is a huge possibility that if such black holes exist, they must be beyond the current energy reach oh LHC . But some researchers suggest that quantum black holes smaller than a proton may exist if extra hidden dimensions also exist. At present LHC is switched off for an up gradation. And it is due to start hunting for new particles again in 2015, and smashing sub-atomic particles at its maximum energy at 14 terra electron volts. LHC might be looking for quantum black holes from the very first day it turns on high energy, in 2015. Light is the most remarkable and amazing thing in universe… as we peer the whole universe through eyes of Light. It can be just simply stated that light is nature’s way of transferring energy through space. But just imagine what happens if light is halted or completely stopped?? Not day dreaming, but it’s now possible. 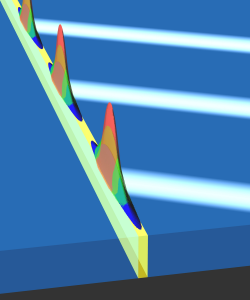 There are some applications which require the light to hold still for a moment, for this researchers have proposed a method could decelerate light pulses down to 20 meters per second inside a waveguide made of a long strip of silicon sandwiched between layers of another material. Researches Kosmas L. Tsakmakidis, Tim W. Pickering, Joachim M. Hamm, A. Freddie Page, and Ortwin Hess have been working on this, their results using transparent conducting oxides at telecommunication wavelengths show how, without increasing optical losses, multiple light pulses can decay with time precisely at their injection points, unable to propagate despite the complete absence of barriers in front or behind them. Previously the physicists headed by Thomas Halfmann at the Institute of Applied Physics of the Technische Universität Darmstadt, stopped light for about one minute in which they used used a glass-like crystal that contains a low concentration of ions – electrically charged atoms – of the element praseodymium. In this the light turns into a kind of wave trapped in the crystal lattice. 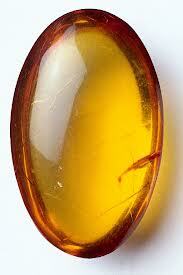 Amber is a vitrified resin valued for its beauty and the intriguing specimens occasionally trapped within it. Now, scientists are studying ancient amber samples to determine how their glasslike properties change with time. Amber is a unique example of a glass because it has “hyperaged,” i.e., has undergone thermodynamic stabilization for millions of years—a process that is impossible to replicate in a lab. Conventional, nonhyperaged glasses characteristically exhibit a so-called boson peak—an enhancement in the density of vibrational states over that expected for a crystalline solid. As reported in Physical Review Letters, Miguel Ramos at the Autonomous University of Madrid, Spain, and his collaborators used 110-million-year-old Spanish amber samples to investigate how the boson peak changes as the amber samples are subjected to thermal annealing, which effectively de-ages them. Previous studies suggested that the strength of the boson peak diminished with annealing, although the samples that were tested had only cooled for moderately short laboratory time scales. Ramos and his team measured the specific heat of several amber samples, comparing specimens of pristine hyperaged amber, samples that had been annealed at temperatures below and around their glass transition temperature, and “rejuvenated” amber that had been heated well above its glass transition temperature. The annealed samples represented glasses with partially erased thermal histories, while the rejuvenated amber had had its 110-million-year cooling cycle effectively erased. The authors found that the specific heats of all the samples were identical within the experimental errors for temperatures below 1 kelvin. This finding implies that the boson peak and other thermodynamic properties remain fossilized in the glass—much like a trapped insect—and are unchanged by more than 100 million years of aging. Scientists in Germany have reportedly created the atoms of yet-unnamed element 117 and are in progress of moving it closer to being officially recognized as part of the standard periodic table. Several atoms of element 117, which is temporarily named ununseptium have been created and observed by the researchers at the GSI Helmholtz Center for Heavy Ion Research, an accelerator laboratory located in Darmstadt, Germany. The super-heavy elements include all the elements beyond atomic number 104, which are not found naturally on Earth, and thus have to be created synthetically in a laboratory. 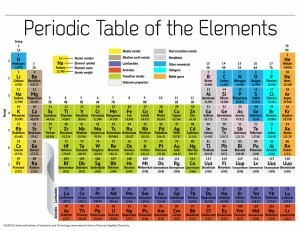 This element was previously one of the missing items on the periodic table of elements. Element 117, as it is called because it has an atom with 117 protons in its nucleus. The classic Periodic Table organizes the chemical elements according to the number of protons that each has in its atomic nucleus. El Niño Southern Oscillation, the most important phenomenon of the climate variability and which plays a very important part in South West Monsoon, can now be predicted about 1 year ahead. Till now through conventional methods its forecasting is limited to 6 months ahead. But through recent approach based on network analysis has indicated the return of El Niño in late 2014.